To keep the discussion here in manageable chunks, this first post argues that Morris is not persuasive in his claim that CAFE works. A second post will highlight Morris’s more insightful discussion concerning gasoline taxes. Source: Eric Morris, Freakonomics blog. CAFE standards were aggressively increased from 1978 to 1984, and, as the chart above shows, fuel economy responded. However, from 1985 until 2007 CAFE standards were no longer raised meaningfully—and MPG flatlined. The table makes it pretty clear that the CAFE standards created a floor under MPG for a 25-year period, when low gas prices (remember those?) rendered consumers otherwise indifferent to fuel economy. Yes, gas prices, remember them? Beginning around 1976, gasoline prices jumped from about $1.73 (EIA data, annual average price per gallon of unleaded regular gasoline in constant 2005 $) to about $2.65 by 1981, then they drifted back to around $2.00 in 1985. In 1986, gasoline prices dropped under $1.50 and stayed around that level until about 2003. From 2003 to 2008 gasoline prices moved up with crude oil prices, in 2009 they started coming down again. The big moves in measured CAFE came when gasoline prices were high. The long low-price period saw both measured automobile and light truck CAFE levels drifting downward. Now look at the chart again: the average of measured “car” and “truck” CAFE levels (labelled “both” in the chart) fell faster than either the car or truck level. How is it possible that the average of two data series fell faster than either of the component data series? 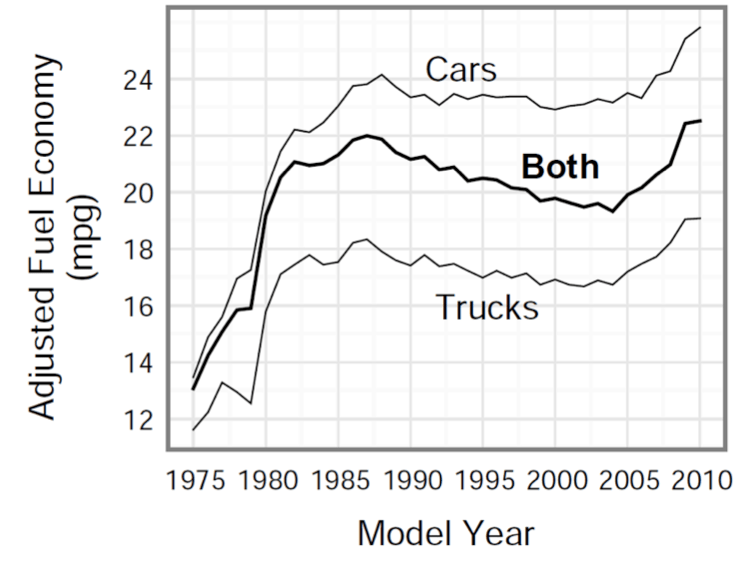 Because “both” is a weighted average, and as gasoline prices stayed low consumers limited by their options in the more-tightly-regulated automobile category simply switched into light trucks (i.e., minivans and SUVs). Automakers, too, feeling constrained by CAFE standards, pushed consumers to make that shift. What exactly are the policy benefits from driving consumers out of station wagons and into SUVs and minivans of similar fuel economy performance? CAFE “worked” when it has a supporting high gasoline price environment, but I suspect that the gasoline prices were doing most of the heavy lifting. RELATED: In part II, I highlight what Morris explained well about gasoline taxes.